I played around with social media statistics this weekend. Apparently some 7% of both my Twitter followers and readers of this blog are from the UK. That more than justifies me posting BBC Micro:Bit news. That’s my story and I’m sticking with it. Only about half of the people who read this blog are in the US. That was a surprise. India is the country with the second most visitors to this blog. Happy to have everyone. Hopefully people become because they find useful information. So here now this week’s links. TeachCS is a new program to help raise money to help computer science teachers pay for professional development. Teachers may use these funds to attend professional development programs for one of three NSF backed high school computing courses: Exploring Computer Science (ECS), Bootstrap, and Advanced Placement (AP®) CS Principles. The more students your school has on free-and-reduced lunch the more money you can get. US only because of where the public money comes from. What can you build with a Micro:Bit? – This article highlights some interesting projects by actual students. Lots of fun stuff. Good/bad news: CS is the top major for women at Stanford--while nationally the percentage of Female CS majors dropped. One thing every programmer should do to succeed in the tech industry, according to an ex-Microsoft engineer – short answer learn to COMMUNICATE! "I would advise folks in software to do one thing, and that's write," he told Business Insider. "Learn how to write ... It's actually useful. You need to know how to express yourself. And it's really tough for a lot of engineers to step up and do public speaking." Daniel Moix ‏@moixland posted a very good video presentation called CS Praxis Pass By Reference Video Tutorial It’s a great review. Chicago mayor calls for national CS and coding requirement for High Schools. “Just make it a requirement,” says Chicago mayor of computer science in high school Ah, if only it were that easy. KidsCodeCS is a bi-monthly magazine about kids, programming, CS & how we use technology in our daily lives. https://KidsCodeCS.com Looks interesting. New from Garth Flint So You Got That Computer Science Teaching Job. Now What? @csnyc Hosted a computer science pedagogy meetup. Want to see the video? http://bit.ly/cspedagog Several different presentations were recorded. 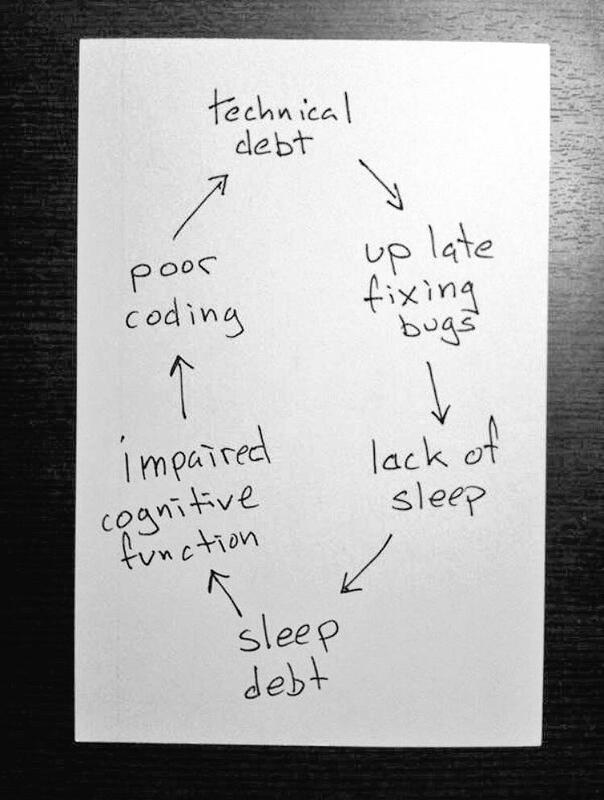 I think this graphic was aimed at professional developers but I have seen it in a number of areas. I’ve been the victim of this myself. Schedule some rest people. You need it!